Katja is the German editor of LinuxFocus. She likes Tux, computer graphics, film & photography, travelling, Montréal and the sea. Have a look at my newly designed homepage at http://www.tuxgraphics.org. 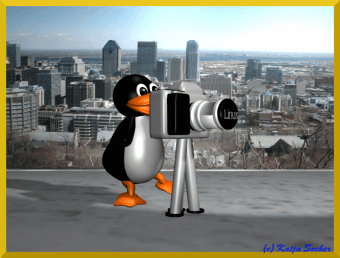 In this article I show you how to create a panoramic picture using Hugin, Enblend and The Gimp. I have always been impressed when I saw a picture displaying a panoramic view. Still I don't owe a camera with a panorama function. But it's not necessary. With Linux all things are possible and you can create great panoramic views by using hugin, enblend and The Gimp. Hugin stitches the pictures together and sometimes what it produces alone is already satisfying. Most of the time however you will want to improve the result further. Enblend tries to make the result more seamless. Finally to give your image the final touch you manipulate it with the Gimp. Okay, let's see how it works. Here you see a couple of images of Montréal that were taken from the Mont Royal sometime in April this year. I'll tell you the steps I took to get a panoramic picture out of them so that you can apply this to your own works. First I created a new directory and sorted the images I wanted to use in there. This is not really necessary of course but I find it easier this way. As far as I know you can't sort your pictures within Hugin but have to add them in the right order. You need to choose your images carefully as the quality of the output image depends very much on them. Make sure that they were taken from the same distance so that the objects they show are almost the same size in the different pictures. And of course the pictures need to overlap at least a little bit (it's recommended that they overlap at least 20-30%). Okay, after choosing your pictures you start hugin and add your images under "Images". Click on "Add individual images" and choose the directory with your images. If you have sorted them into one directory you can select them all at once by pressing ctrl while clicking on each picture. Otherwise you can select them individually. You get a preview of your image if you select it. This way you can check that you really selected the right images. Sometimes it is good to select one of the pictures as an anchor point for position, this will then be kind of a basis to align the other pictures around this anchor. Now you change to "Cameras and Lens". Select one of the images. In many cases this will fill out the "Design Parameters" automatically. If not you need to fill in the "degrees of views" with a number of around 40 (hugin filled this field with the value 41.112 in my case). This is the degree of view that most "normal" digital cameras are using. The lens type usually is "Normal (rectlinear) and the values of the focal length hugin filled in as 12.48 and the crop factor as 3.8. That way you have some values in case your camera isn't detected. If you have a special camera you should consult your manual or play a bit around with different values. Next you go to the "Control Points". This is the place where you spend most of your time. Make sure that you have "auto fine tune" and "auto add" checked. This way hugin will help you set the control points correctly and correct them a bit if necessary. Now on top you see a list with the image numbers. Select 0 on the left and 1 on the right to see the first two pictures. Click on a significant point in the picture on the left, then look for the same point in the image on the right. If your second click is out of bounce Hugin will tell you so and you can reclick. Usually you will need 3 or 4 points. Hugin uses them to see where the two images overlap. So if it is a difficult images you may need more control points. After clicking on those points you get a text like "found corresponding point, mean xcorr coefficient: 0.987115". Unfortunately a new point not always improves the value so you may want to delete a point again by clicking on "delete" below. For selecting good points for Hugin you should try to select sharp points and those that have lots of contrast. Also avoid points too close to the edge and if you have a panorama with things in the foreground it is said to avoid selecting objects there to avoid parallax. You can also enlarge the size in which you view the picture to 100% or more to select the points more precisely. Now before continuing with the next pair of images first go to "Optimizer", let the default "Optimize positions (pairwise...) as is and click on "Optimize now!". Then return to the "Control Points" section and repeat the whole procedure (click left on image 1 and right on image 2 to select the next pair etc.) until you worked through all the images. After optimizing the last pair you go to the "Stitcher" section. Let's start from below. There you need to decide which image format to use for your output file. If you don't want to use enblend you can choose jpg, png or tiff. If you want to enhance your picture with enblend afterwards which will usually be the case you have to choose "multiple tiff" here. This way you don't get one finished image but as many pictures as you had previously given into hugin. Next you need to choose the Stitching engine. By default the field says "PTStitcher" but if you haven't installed this explicitely you need to choose "nona" here. Click on "Calculate Optimal Size" and on "Calculate Field of View". You have almost made it. Before you hit "Stitch now" you only need to decide whether your output should be a rectilinear, a cylindrical or an equirectangular. If you only stitch two images together rectilinear will be the right choice, if you have several pictures but no 360 degree view cylindrical will probably the right choice and for an all-around view you choose equirectangular. The thing is that if you make the wrong decision here hugin will either stop with an error (if you want an eqirectangular view while the input is only for rectangular for example) or the result will look strange (if the result should be cylindircal while you chose rectilinear for example). After clicking in "Stitch now!" hugin asks you to specify an output file and then starts stitching the images together. This will take some time so you should go and have a cup of tea while phoning with your grandmother. where output.tif specifies the file you want the result to be saved in and input1.tif stands for the first image etc. If you look at your image now you already have a panoramic view. Still you need The Gimp to give your panorama the final touch. With Hugin and Enblend you usually get a picture with some empty spaces. If you don't know The Gimp well or don't want to spend much time you can simply select the part of the image that has no empty space with the rectangular selection tool , right click in the image on Edit-->Copy and then File-->New. A new file opens, then Edit-->Paste and File-->Save as to save this new picture. But often it is also possible to fill the gaps by using the clone tool in combination with blur . You first apply the clone tool carefully. It's always good to work on a copy here (Image-->Duplicate) as you might want to discard your changes especially if you are not very experienced with this tool. If you have selected the clone tool you click with your mouse in the area that is to be cloned while you hold the Ctrl-key down.Then you release the key and click with the mouse in the area that you want to paint over. Now you can use the clone tool the same way you would use a paint brush. Sometimes you will get a more natural looking picture if you define a new cloning area several times. Finally to get rid of the seams that are still there even though they shouldn't be that big you click on the blur tool and work with the mouse along the seam until you are satisfied. Then you can save the picture. Of course it is also possible to fill in some gaps and cut the rest. Enjoy and create! And as always Happy panoraming! There you can download Hugin and also find some useful tutorials. The installation of hugin is a bit complex because it depends on a lot of other non standard packages. To use PTStitcher you need the panorama-tools-nonfree package. Otherwise you can use the nona stitcher. You can download enblend there and can also learn more about how it does what it does. The installation of enblend is straightforward. Here you will also find updated versions of this article in English.